Search Engine Guide > Mike Moran > Are You Ready for Auto SEO? No, I don't mean that search engine optimization will happen automatically. I am asking if you have considered what the world will be like in the not-too-distant future, when a big chunk of searches will be executed from your customers' cars. Perhaps this strikes you as a bit too much Buck Rogers, but many people thought we wouldn't be searching for things from cell phones not too long ago. The technology is arriving and it's not too soon for marketers to start thinking about how it will change their businesses. 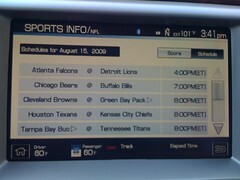 If you don't believe that this technology is coming, just take a look at the Ford Sync. It's just one manufacturer's example of what is to come. Once cars have cellular antennas built in, it's just a matter of time before we start using voice recognition for more than GPS and cell connections for more than calls. Expect to be able to send a text by speaking. Expect to be able to start your car outside from your computer to warm it up or cool it down before you get there. Expect that your mechanic will sometimes know what is wrong with your car before you bring it in. There are many reasons that car manufacturers will want to build connected cars, many reasons why consumers will want them, and every reason to expect that what we do on computers and on phones will begin to happen in our cars also. At first, it might seem the same as every other mobile marketing opportunity, and in some ways it is. Most companies attract customers after careful consideration, not the spur of the moment, and mobile marketing probably won't change things very much for them. But if you run a Starbucks or a bar or a restaurant, you've probably already seen how mobile marketing might work for you. In fact, if you are located in a large city, it is already a part of how customers make their decisions. They walk around with their mobile phones and they decide how to get what they want. But in the suburbs, mobile marketing isn't making the same impact yet. People are more likely to use their computers to decide where they are going before they get in the car. In-car technology might change that. After all, think about how we once figured out driving directions. Not that long ago, we used paper maps, or we asked someone to give us the turn-by-turn directions. Then, we used Mapquest to print out the directions before we got into our cars. Now, all we need is the address to put into the GPS systems. We literally get into our cars before we know where we are going. Once our cars are online, you should expect us to begin getting into our cars before we even know the address. We might have only a search query in mind. We'll use voice recognition to speak our search and the results will pop up on the display. Perhaps they'll be spoken to us so we can verbally choose which one we want. Our results will be ordered by proximity as well as relevance, not unlike how Google Local Search is beginning to work now. Perhaps it will also favor drive-thru locations. And when we choose our favorite, we'll be able request to transfer the address to our GPS system so that we get turn-by-turn directions. We might even be able to place an order to be picked up when we arrive. You can do some of these things now with a GPS system. You can find a restaurant and get directions to go there, without needing any Internet connection. But real-time traffic needs some kind of connection. Checking out reviews and making a reservation (or ordering from the drive-through) does, too. Expect to see all of this in the next few years. In ten years, most people will have these features. I don't know if the car computers will be smarter and faster, or if we'll use our phones (much the way Bluetooth can hook up your phone to Ford Sync today), or if it will be some even-smarter combination of both. If you think about how city businesses are beginning to focus on mobile marketing, now consider how much bigger the market will be when all those solo drivers can do searches from their cars. Some businesses will find this a bigger change than others, but the time to start thinking about it is now. Have you claimed your Google Place Page? Do you even know what comes up when you do a search? In some ways this will be a gradual change. After all, people execute searches from their cars now, but they use their phones. We hope that they aren't driving while they do that, but I've been on several car rides with business colleagues where we are pulling away from the client location and a passenger whips out their Yelp app to figure out where we should eat. It will also be gradual because this it takes a while for any new car technology to become pervasive—my guess is that most cars, even in the U.S., still don't have GPS. It just takes that long for the old cars to be replaced, and not that many people buy stand-alone systems to bridge the gap. I am no expert on whether in-car technology is safer than using your hand-held phone. My uninformed opinion would be that it is safer, because the technology can be designed to work within the task of driving. Certainly, it would be safest of all to avoid any distractions at all, but we all play the radio and fiddle with the GPS and distract ourselves in many way while driving. My suspicion is that in-car technology will be safer than peeking at our iPhones while driving, but there might be a lot of regulation before we see wide adoption. Regardless, it doesn't take a crystal ball to see what is coming. If you take the time to think about it now, you might reap more of the benefits later. Mike, this is an incredibly forward-looking article. Such a fascinating topic. Then again, given your background, I'm not surprised to see you bring up something like this. Thanks for a good read. Loved it. The computer system already exists in some Ford trucks. In 2008, Ford Motor Co. launched an advertising campaign to market the asset tracking system for tools, along with the in-dash personal computer it will make available in 2009 Ford F-150, F-Series Super Duty pickups and E-Series vans. It works through satellite communication. Marketers just need to figure out how SEO and paid search will work in systems geared for cars. You're right, Laurie. Much of the technology is in place already in some vehicles and we are waiting to see how marketers take advantage. I really appreciate if I could send a text message only with speaking to the device. This could be also very useful for drivers! Very good post! We will definitely be seeing more and more connected cars being made available to the public in the not-so-distant future like the Ford cars that are equipped with SYNC with MyFord Touch. It's something everyone in the Internet Marketing industry should be aware of so when they do arrive we won't be in shock or panic, we'll be ready to create some marketing plans! Great article Mike. Thanks! This all sounds fair enough. I think in fact it's here already in some capacity. Portable sat navs are already incorporating live traffic reports and helping you answer your phone hands free. We already have points of interest and if I'm not mistaken, Tom Tom have already brought out a unit that works with Google. The interesting part of this is that auto tech seems to take forever to keep pace. I don't know about America, but over in the UK here it was something like 20 years from the birth of the CD to the players being installed as factory fit in trucks. That's some time lag! So yes I think it's close, but I think its the portable unit that'll come in way before the factory install unit. Just recently in 2010 I've seen some cars with usb points in the dash for flash drive music collections I suppose. How long have we had flash drives? The point being that they are stupidly behind on this as usual. Hey Mike, really cool update. I find it quite real when you think about where auto technology is going. The electronic box most new cars have records your speed and conditions at the point of an accident so why not expand that and send along the information to insurance companies? Mechanic? Police Dept? I do how ever like the idea of the car sending along vital statistics to mechanic like, Hey Stu you need an oil change, or a tune up. With cell phone tracking, GPS, location, etc... it's time the auto industry got more technical so we can know where were going and use the phone at the same time. PS>> think they can add a fax machine to that?